I'm going to call it a day now. Many thanks for company today. Congratulations to Motherwell, Hamilton, Inverness Caley Thistle and St Johnstone on their wins. Enjoy the rest of your Saturday and join us for coverage of Scotland's second match in the Rugby World Cup tomorrow. "It was a magnificent display from Ryan Christie marred by that late red card. I don't think that second yellow was really deserved. We all know he's going to Celtic and maybe he wanted to do them a favour today but we're not complaining." The Dons gaffer does not sound best pleased but once he's calmed down he might take a degree of comfort from Celtic's slip at home. Aberdeen now lead the way by four points. "Although we played with bags of spirit and enthusiasm in the second half and could have got the equaliser it still doesn't mask the fact that the first half wasn't good enough. I thought 2-1 flattered us in that period. That 45 minutes might have been the worst performance in my time here." "We're pleased with the point but I'd like to build to a team that comes here and wins but that takes time. Last year we came here and lost 4-0, so we're improving." Kilmarnock are the team being leapfrogged by Motherwell and home fans will be very disappointed, having seen their team go in 1-0 up at half-time. Hamilton came roaring back to bang in three games after the break and now sit level on points with third-placed Hearts. Motherwell jump up a place in the table as caretaker boss Stephen Craigan opens with a 2-1 win at home to Partick Thistle. That will do his chances of landing the job no harm but things are already looking grim for the Jags, who are stuck at the bottom with a mere three points from nine games. My head is spinning after that flurry of late red cards! I think I got them all... Those three dismissals took the total to five for the afternoon. Aberdeen's winning run in the Premiership is over but Celtic fail to take advantage as they are held at home. St Johnstone come from behind with 10 men and poor old Partick Thistle are still searching for a win. They're still going at Dens Park as County defender Chris Robertson clears a looping header from Gary Harkins off the line. Another chance goes a-begging for the Dons in stoppage-time. Ash Taylor can't finish from a goalmouth scramble just before the final whistle goes. Aberdeen's 100% record is gone. And another one! Lee Ashcroft is off for Killie! The home defender resorted to skulduggery to stop Dougie Imrie from racing in on goal. Inverness CT are down to 10 men as Ryan Christie lunges into Graeme Shinnie to collect his second yellow card. Aberdeen go close again as David Goodwillie lofts an effort towards the top corner but Owain Fon Williams pushes it on to the bar and over. Kilmarnock are all over the place at the back as Christian Nade runs on to a terrible back-pass only to poke his shot narrowly wide of the target. The visitors go close again as an Ali Crawford corner is met by Ziggy Gordon but his header is hacked off the line by Mark O'Hara. Nir Bitton sends a header wide as Celtic begin to apply some late pressure as they desperately look for the breakthrough against Hearts. The Jags end their long goal-drought as substitute David Amoo heads home as the ball comes his way from a corner. It's been coming. Dundee are level as Paul McGinn breaks forward from full-back and slips a pass to Rory Loy, who rockets home his second goal of the game. The hosts continue to dominate the ball but they are finding openings harder to come by now as Hearts stand firm. It's the depleted home side who are looking more likely to get a second goal. Graham Cummins fire in a low drive which is deflected just over for a corner. A bit of daylight for the Steelmen now as Scott McDonald has a header well saved by Tomas Cerny but is well placed to volley the rebound into the net. A rather flat second half after three goals in the opening 45 minutes. The Dons are just edging it now and Peter Pawlett tests Owain Fon Williams with a free-kick. Ten-man Saints are level as Graham Cummins thumps a powerful header home from a Liam Craig corner. Just prior to the equaliser, United spurned a golden chance for a second, with Mario Bilate is clear of his marker on the edge of the six-yard box but failing to test the goalkeeper with a failed attempt at a volley. Ali Crawford continues his impressive start to the season as he slots Accies ahead at Rugby Park from Greg Docherty's cross. Rory Loy is cool as a frozen cucumber as he sends Scott Fox the wrong way from the spot and Dundee are right back in it. The Staggies are down to 10 men as captain Andrew Davies is shown his second yellow card of the afternoon for bundling over Rory Loy and the downed midfielder will take the spot-kick. Striker Brian Graham is immediately sacrificed by County boss Jim McIntyre to allow Scott Boyd to come on at the heart of the defence. Two free-kicks in quick succession for St Johnstone. Liam Craig's effort is pushed away from the bottom corner by Luis Zwick, before another floats to the back post but is just a little too high for the strikers. The home side, despite their one-man disadvantage, have started the second half in lively fashion. Ross County need to make a change as Martin Woods was injured in the first half and has been replaced by Stewart Murdoch. That game is just getting back under way. Sean: "We don't get them often up here but that was an absolute 'goalazzo' from Ryan Christie. Back to his best today." Saints striker Steven MacLean has his head in his hands as a shot from Murray Davidson is deflected into his path 10 yards out and he blazes his effort over. Dougie Imrie levels the scores for Hamilton Academical with his second goal in as many games, a thunderous effort in off the underside of the crossbar. Motherwell winger Lionel Ainsworth is clean through but can only crash his shot straight at advancing goalkeeper Tomas Cerny. We're up and running again. "Not much to split the sides, with lots of desire on show. Certainly, Stephen Craigan will be the happier manager," BBC Sportsound pundit Derek Ferguson. BBC Scotland's Richard Wilson at Rugby Park: "On chances created, Kilmarnock do just edge this encounter, and they might have added to their advantage. A flurry of attacking play just before half-time would have served as a reminder of Hamilton's threat, although the home side at Rugby Park have defended robustly so far. The victory is within reach for Kilmarnock but there is still a lot of hard work to carry out to secure it." "It's been a breathtaking game and Inverness thoroughly deserve their lead," BBC Sportsound pundit John Robertson. BBC Sportsound Pat Bonnar at Celtic Park: "Celtic have really dominated this first half and should really be going in two or three nil up." Jackson Irvine pings in a cross and here comes Michael Gardyne to meet it at the back post and send a looping header over keeper Scott Bain. A lovely goal from a team oozing with confidence. With Adam Rooney on, it's Niall McGinn being replaced by the Dons, holding his groin. Another great save by on-loan goalkeeper Danny Ward to deny Ryan Christie who had ghosted in at the back post. Derek McInnes is already preparing to bring on Adam Rooney with the league leaders toiling in the Highlands. BBC Scotland's Scott Davie at Dens Park: "Oh dear what was poor James McPake thinking about as he headed Marcus Fraser's cross from deep past his own keeper to give County the lead." Jackie McNamara's men are getting the ball into the box but have yet to capitalise further on their one-man advantage. Adam Taggart fires a low shot which is saved then Billy McKay stretches but can't get near a cross to the back post. A horror show at the back for Dundee as James McPake diverts a seemingly innocuous cross beyond his goalkeeper Scott Bain to nudge County ahead again. A great chance for Aberdeen to level as Andrew Considine nods the ball into the path of Jonny Hayes 12 yards out but the little winger's shot is wild and flies high over the stadium wall. BBC Scotland's Scott Davie at Dens Park: "We got two great goals in a couple of minutes after a frantic start with Liam Boyce cracking in a angled drive for his 10th of the season and Greg Stewart claiming his fifth with an equally brilliant finish - well worth seeing on Sportscene tomorrow night." Celtic keep coming and Hearts goalkeeper Neil Alexander dives to save a long-range effort from Nir Bitton. Niall McGinn's corner meets the head of Ash Taylor, who heads one back for the league leaders. A cheap goal for the home side to lose with the marking non-existent. Kallum Higginbotham charges through the middle to slip a pass to Greg Kiltie, who coolly picks his spot. Billy McKay thumps a shot from the edge of the box but Zander Clark is able to get behind it. United toiled in the opening stages but since the penalty and red card the momentum is now firmly with them. The Highlanders double their lead as Ryan Christie weighs up his passing options, sees nothing on, then absolutely hammers a shot past Danny Ward. The ball was moving all over the place in the air. Leigh Griffiths loops a header wide when he should have hit the target and the Celtic striker misses then another good chance, nodding straight into the arms of goalkeeper Neil Alexander. Billy McKay sends his penalty down the middle and substitute goalkeeper Zander Clark's first job is to pick the ball out of the net. Anything Liam Boyce can do, Greg Stewart can match, as he levels the scores almost instantly with a powerful left-foot effort of his own. Saints keeper Alan Mannus is sent packing for taking out United striker Billy McKay, who was haring after a terrible back-pass. Poor Michael O'Halloran is the player sacrificed to bring on the sub keeper. Liam Boyce finishes a blistering counter-attack sparked by Jackson Irvine with a smart left-foot strike into the bottom corner. Lionel Ainsworth speeds away from his marker and his cross is put into his own net by unfortunate Jags defender Frederic Frans. It's all Inverness! Aberdeen are being ripped to shreds as Miles Storey flights down the wing, cuts it back for Liam Polworth and only a fantastic save from Danny Ward keeps it at 1-0. Celtic winger James Forrest's thundering strike crashes off the crossbar after a fine piece of set-up work by Leigh Griffiths. Almost another for the hosts. Ross Draper is through on goal, all he has to do is dink the ball over goalkeeper Danny Ward, but Paul Quinn makes a last ditch challenge to deny him. It's been all Celtic but here come Hearts as Juanma sends a curling drive just over the crossbar after being set up by Osman Sow. Jags midfielder Stuart Bannigan has a pop at goal but it's an easy save for Connor Ripley. Earlier, the hosts had a great chance but Marvin Johnson's effort was blocked by the legs of visiting keeper Tomas Cerny. Prior to that opening goal from Miles Storey, David Clayton in Inverness was in touch by text: "I am an ICT fan and will be there today but I can't help but be impressed by Aberdeen and what they are trying to do. Their fans always turn up in great numbers. Not holding much hope for today but looking forward to the game all the same." The home side have had the better of the opening exchanges as Michael O'Halloran sees an effort blocked on the line. Ryan Christie gathers a pass from Danny Devine and leaves Dons captain Ryan Jack for dead to set up Miles Storey, who takes a touch and batters a shot past Danny Ward for an emphatic finish. BBC Scotland's Scott Davie at Dens Park: "We had a poignant minute's silence at Dens Park for the fallen at the First World War Battle of Loos followed by a rousing round of applause for the former and current armed forces representatives who are guests of Dundee FC for the match." Celtic striker Leigh Griffiths breaks through the Hearts defence but his shot is weak and does not trouble goalkeeper Neil Alexander. Kenny McLean tries a shot and takes goalkeeper Owain Fon Williams by surprise but the Inverness goalkeeper is able to parry it away for a corner. BBC Scotland's Richard Wilson at Rugby Park: "Jamie MacDonald makes the starting line-up for Kilmarnock despite injury concerns during the week and the signing of emergency goalkeeper cover. The home side will be looking to Josh Magennis to continue his midweek scoring form, but Hamilton have been effective in defence and attack this season. These two sides should be well-matched, with both adept at playing on an artificial surface. This should be a competitive and evenly-balanced contest." "Thursday and Friday were a bit of blur. I picked the team purely on players that I think can hurt the opposition. I'm not even sure how many changes there are from last time." The champions ran riot against Dundee last weekend, banging in six goals, and rested a few key players for the midweek League Cup win over Raith Rovers. Top-scorer Leigh Griffiths is among those returning today as Celtic look to extend their winning run against Hearts to 11 games. The aggregate score from the last 10 meetings is a whopping 35-2! Hearts will be buoyed by their late comeback win at Kilmarnock on Wednesday as they look to arrest a slump in league form. The Jambos started with five wins on the spin only to lose the next three. The hosts conceded six in their last game, while the visitors scored seven. Dundee boss Paul Hartley will be looking for a big reaction from his players after describing the hiding they got at Celtic Park as "unacceptable". Aston Villa's on-loan midfielder Riccardo Calder get his first start. Ross County are unbeaten in six games and enjoy a good record against today's opponents, having not lost any of the last 10 meetings. Liam Boyce is a striker on form and needs one more goal to get to double figures for the season. BBC Scotland's Jonathan Sutherland on Twitter: "Just to clarify, the black-eye Stephen McManus is sporting WASN'T a result of anything that went on in the Motherwell dressing room." Stephen Craigan gets his chance to stake a claim for the Motherwell manager's job as he takes over from the sacked Ian Baraclough on an interim basis. Baraclough's last act was a League Cup loss at Morton as the Steelmen sit 10th in the table with a mere seven points. If Craigan gets a good response from the Fir Park dressing room it could spell bad news for the struggling visitors, who are the only top flight side without a win yet. Remember that old Billy Connolly joke about him thinking for years that the team was called Partick Thistle Nil? The Jags have only scored in one of their nine outings in all competitions this season. Back-to-back league wins have helped lift Kilmarnock up the table and relieve some of the pressure that was undoubtedly building on manager Gary Locke. Both victories came after conceding the first goal, which suggests there is no lack of spirit in the squad. Goalie Jamie Macdonald is back between the sticks after missing the midweek cup loss to Hearts. Accies earned the Lanarkshire derby bragging rights last weekend and are ticking along quite nicely in the top half of the table. Both of these teams enjoyed 3-1 League Cup victories during the week but they achieved them in very different ways. Saints went to Ibrox and picked Rangers off with ruthless precision, while United had to come from behind at home to League One Dunfermline and required extra time to get the job done. United have won just one of their league games so far, with St Johnstone managing only two, so both could do with another. 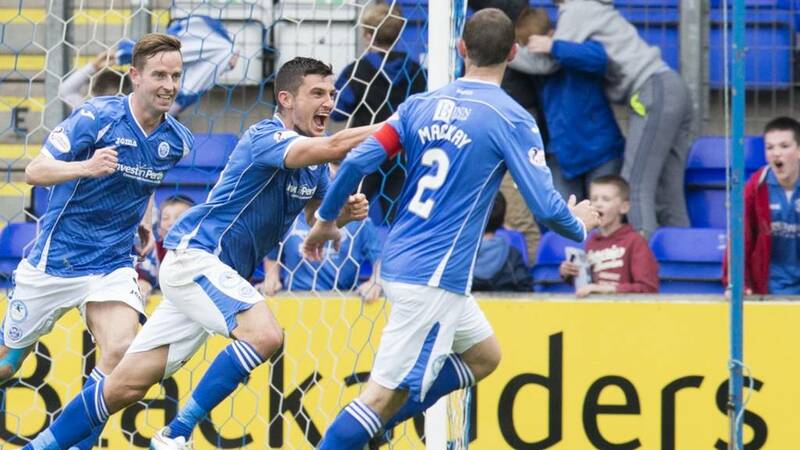 Saints are unbeaten at home to their Tayside rivals over the last three seasons, winning three of the last four at McDiarmid Park. That earlier picture of Inverness with the Scottish Cup is sure to brighten the hearts of Caley Thistle fans since this season has been a bit of a struggle. But there are signs of improvement, with John Hughes's side unbeaten in their last four outings as key players return to fitness and new arrivals bed in. The Dons are top of the pile after a perfect eight wins from eight in the league. The bubble was burst by two fantastic late goals from Hibs in the League Cup on Wednesday, so how will the Reds react? Aberdeen are unbeaten in their last six meetings with ICT and won all four fixtures last season. "I haven't talked about or even thought about Fenerbahce [Thursday's Europa League opponents]. The league is the most important thing for us." BBC Scotland's Jonathan Sutherland: "Motherwell caretaker boss Stephen Craigan goes for a good old-fashioned 4-4-2 formation, with Scott McDonald and Louis Moult up front. Partick Thistle will look to Kris Doolan and Robbie Muirhead to end their goal drought." Ross County: Fox, Robertson, Graham, Davies, De Vita, Woods, Reckord, Irvine, Gardyne, Boyce, Fraser. Subs: Woods, Boyd, Franks, McShane, Dingwall, Murdoch, Foster. Graeme Shinnie has recovered from a midweek heel injury to line up against his former side, while Josh Parker makes his first start for the Dons up front. Winger Jonny Hayes is back from suspension, while strikers Adam Rooney and David Goodwillie are on the bench. Can Aberdeen make it nine wins from nine in the Premiership? Aberdeen: Ward, Logan, Shinnie, Considine, Taylor, McLean, McGinn, Hayes, Quinn, Jack, Parker. Subs: Brown, Rooney, Smith, Robson, Pawlett, Goodwillie, McLaughlin. BBC Scotland's Scott Davie at Dens Park: "Dundee are marking the 100th anniversary of the Battle of Loos with a solitary piper playing a lament followed by a minute's silence prior to kick-off. "The city's 4th Black Watch battalion suffered huge losses at Loos with 57% killed or seriously injured on the first day of the battle. "Dundee are wearing a special strip to mark the event which incorporates the Black Watch tartan and battalion badge." "We know there will be disappointments along the way, we just need to keep them to a minimum. Lots of hard work has earned us the points we have and we need to keep that up." Mixu Paatelainen was a guest on BBC Radio Scotland's Off the Ball earlier. When asked if he'd applied for the Motherwell job, his reply was "not yet." The former Finland boss added: "It's a good job. Motherwell is a fantastic club." Would 'Well fans welcome big Mixu or do you want Mark McGhee or Stuart McCall back or is it a case of wait and see how Stephen Craigan gets on? Partick Thistle: Cerny, Dumbuya, Frans, Seaborne, Booth, Welsh, Osman, Bannigan, Lawless,, Muirhead, Doolan. Subs: Scully, Miller, Amoo, Stevenson, Lindsay, Nisbet, Pogba. St Johnstone: Mannus, Mackay, Scobbie, Shaughnessy, Easton, Millar, Davidson, Craig, O'Halloran, MacLean, Cummins. Subs: Clark, Lappin, Anderson, Wotherspoon, Sutton, Fisher, Kane. Dundee United: Zwick, Dillon, Morris, Durnan, McGowan, Rankin, Souttar, Fraser, Spittal, McKay, Taggart. Subs: Szromnik, Telfer, Connolly, Donaldson, Bodul, Dow, Bilate. Hamilton: McGovern, Gordon, Garcia Tena, Tagliapietra, Kurakins, Docherty, Gillespie, Imrie, Crawford, Kurtaj, Morris,. Subs: D'Acol, Redmond, Sendles-White, Longridge, Lyon, Nade, Hill. Stefan Johansen on the bench for Celtic? Most unusual. New Hearts signing Arnaud Djoum is also among the substitutes. Celtic: Gordon; Lustig, Boyata, Ambrose, Izaguirre; Brown, Bitton; Commons, Rogic, Forrest; Griffiths. Subs: Bailly, Ciftci, Mackay-Steven, Janko, Johansen, Blackett, Tierney. Hearts: Alexander, Paterson, Augustyn, Rossi, Oshaniwa, Pallardo, Gomis, Nicholson, Walker, Sow, Juanma. Subs: Hamilton, McGhee, Ozturk, Djoum, Buaben, Swanson, Reilly. BBC Scotland's Jonathan Sutherland on Twitter: "57 applications now in for the Motherwell managers position. Safe to say none of them from Messrs Klopp or Henry." It's also Scottish Cup first round day, so we'll keep you posted on how the likes of Banks O'Dee, Linlithgow Rose, Hawick Royal Albert, Strathspey Thistle and Whitehill Welfare are getting on. Will any Welfare fans be making the long journey from Rosewell for their tie at Wick Academy? It's very rare these days that all of the top flight matches are at three o'clock on Saturday. It's a major gripe among fans, so will we see a spike in attendances today? Can Aberdeen keep up their winning run in the league after their midweek cup defeat at Easter Road? How will Motherwell fare under caretaker manager Stephen Craigan? Can Ross County extend their unbeaten sequence to seven games? Do Hearts have a chance of halting their losing league streak at champions Celtic? Will Partick Thistle score a bloody goal? Welcome to a very busy afternoon in the Scottish Premiership.